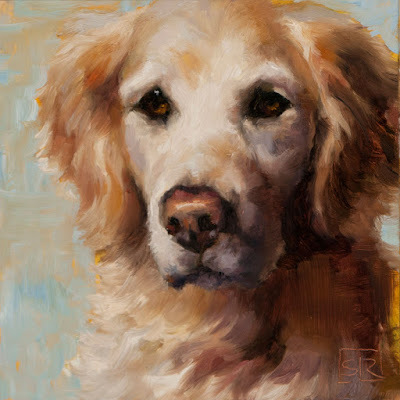 Tasha, Golden Retriever, oil on panel 6" x 6"
When a friend of mine wanted a surprise portrait of her parents' dog last year, I decided to bend my rule about working only from in-person sittings or photos I've taken myself. For this stealthy portrait, we resorted to a cell phone snapshot. While not ideal, the result was so successful that I've decided to offer this option to people who'd like a more expedient and less expensive option (for portraits of pets only). I'll draw the name and contact the winner on December 14th and make the announcement here and on my facebook page. Of course, if you'd prefer not to leave things to chance, or can't wait until the 14th, you can always commission one of your own by contacting me directly. Just follow this link to my website and click the info tab at the top, then contact at the bottom to get my email address.